As the 38th president of the United States, Gerald Ford overtook the presidency after Richard Nixon’s resignation due to the Watergate scandal. Before becoming president, Ford was vice president, a position he was appointed to when Spiro Agnew resigned under Nixon’s presidency. He was the only president to be appointed to both positions without being elected. Ford had a difficult childhood. His mother suffered domestic violence at the hands of his father, and the couple separated when Ford was young. His mother later remarried, and Ford took his stepfather’s name. In high school, Ford was captain of the football team and a star athlete. He graduated from college with an economics degree in 1935 and received contract offers from the Detroit Lions and the Green Bay Packers. Instead, he chose a coaching position at Yale and applied to its law school. In 1941, on his graduation from Yale, he was admitted to the Michigan bar. That same year, he opened a law practice, but because of the attack on Pearl Harbor, he left his practice and enlisted in the Navy. Ford began his political career as a representative from Michigan. He served about 25 years in this position, including eight years as the Republican minority leader. In 1974, Vice President Ford was appointed president immediately after Nixon’s resignation. This marked the second time in his career that Ford was called on to take over a legislative position. During Ford’s presidency, the U.S. suffered a terrible economy, the worst one since the Great Depression almost four decades earlier. One of Ford’s first acts as president was signing the Helsinki Accords, designed to improve relations with Communist Europe. Additionally, Ford became embroiled in controversy early on when he granted a presidential pardon of Nixon. 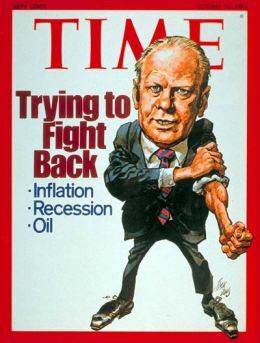 In 1976, Ford was again nominated as the Republican presidential candidate. However, he lost the election to Jimmy Carter, a Democrat. Ford was a fashion model. While attending law school, Ford earned money by posing for fashion magazines, including for the cover of Cosmopolitan magazine. Ford is the only president who was an Eagle Scout, the Boy Scouts of America’s highest ranking. He was involved with the organization from an early age, and during his funeral he was honored by the Scouts — hundreds of Eagle Scouts took part in the procession and as ushers. Ford’s birth name was Leslie Lynch King Jr. Ford’s mother and stepfather changed his name to Gerald Rudolph Ford when they married, although he was not legally adopted. In 1935, Ford had his name legally changed to Gerald Rudolph Ford Jr.
Ford was 93 when he died. He lived longer than any other deceased U.S. president.